"A variety of veggies make this interesting side dish versatile. I like to serve chicken in an apple, onion, and curry sauce over the top and sprinkle it with flaked coconut. Can also be made with quinoa, just adjust cooking time." Place vegetable oil in a saucepan over medium heat, and cook and stir the onion, leek, celery, red bell pepper, and garlic until the onion is translucent, about 5 minutes. Pour in the chicken stock, bring to a boil, and stir in the carrot, tomatoes, couscous, raisins, and currants. Season with curry powder, turmeric, salt, and black pepper; bring the mixture back to a boil. Reduce heat to low, cover the pan, and allow to cook for 5 minutes. Remove from heat. Let the couscous stand covered for 5 minutes, and fluff with a fork. Sprinkle with sliced almonds. Please add curry in half-teaspoon increments to achieve desired flavor and heat. Most couscous will cook in five minutes' time. I also make this using quinoa on occasion. I used 1 onion instead of a leek and an onion, 1 large tomato instead of 2 average sized ones, water instead of broth, and raisins as the fruit. This was a tasty salad atop of a lettuce leaf! 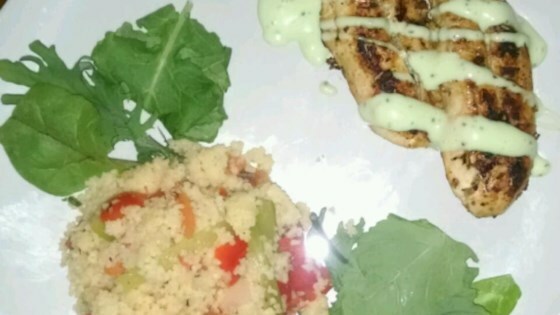 This was the first time I have attempted couscous and it was really easy and delicious! I subbed out some ingredients for others but it was still spot on. so easy and delicious! I added dill to it, just 'cause I happened to have a lot of fresh dill, and it was amazing!